BROWNSVILLE — A century-old Catholic church in Brownsville has been torn down despite fervent efforts by preservationists and former parishioners to save it. Our Lady of Loreto, built at the corner of Pacific and Sackman streets in 1908, has been mostly razed in order to make way for a low-income housing development, Patch reported. The church, which was seen by boosters as a testament to the striving of Italian immigrants and working-class Brooklynites who built it, was shut down by the archdiocese in 2009 due to lack of attendance and the cost of upkeep, Curbed reported. It was then leased out to a corporation owned by Catholic Charities of Brooklyn and Queens in 2011, records show. The Brownsville Cultural Coalition, along with other preservationists and former parishioners, held a funeral Saturday to commemorate the “irreplaceable” building and mourn its “tragic fate,” according to a Facebook page for the event. Miriam Robertson, who runs the Brownsville Heritage House, said the church's supporters had hopes to landmark the property and preserve it as a cultural and performing-arts center. Robertson got involved with the effort to save the church back in 2009, when it first shuttered, A group of former parishioners, mostly Italian-Americans who had since left the neighborhood, asked for her group's help in getting the church designated as a landmark. 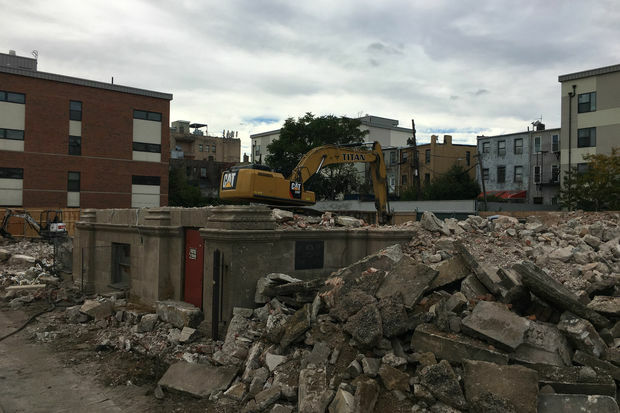 But the effort was ultimately futile, and demolition was approved by the Department of Buildings in March, beginning in earnest in August after a temporary stop-work order was lifted, according to public records. Catholic Charities, along with the city’s Department of Housing Preservation and Development, also built a four-story, 32-unit affordable housing complex adjacent to the church, records show, and finished that building in 2013, according to Curbed. Plans for the project on the site of the former church have not yet been filed, and representatives of Catholic Charities did not respond to a request for comment.